MURATA's package technology expertise has enabled the deveopment of the Chip CERALOCK� with built-in load capacitance. High-density mounting can be realized because of the small package and the elimination of the need for an external load capacitor. 1. Oscillation circuits do not require external load capacitors. 2. The series is available in a wide frequency range. 3. 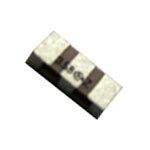 The resonators are extremely small and have a low profile. 1. Clock oscillators for microprocessors.